Use the links on the Districts page to find local meeting schedules and how to contact AA in your community. To search for a meeting anywhere in the U.S. and Canada, use the Meeting Finder on AA.org. To save on shipping costs, groups and individuals can order literature in any quantities from the CMIA32 Literature Committee by email at Literature@cmia32.org. 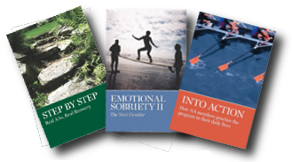 The A.A. Grapevine magazine, "Our Meeting in Print", has recently published three new books, Step By Step, Emotional Sobriety II, and Into Action. Order these and other publications at the "Grapevine Store" or purchase from the CMIA32 literature table. Please fill out and return, so others can share your in your group's history. The biennial Area 32 Inventory is complete. Please look it over, take back to your Groups and let us know what we can do better. We can also take meetings to alcoholics who are hospitalized, home-bound or in hospice. For more information, or to volunteer, email the Accessibilities Committee. Maps & directions to the next Intra-Area meeting, including June 2. The Bridging the Gap Program is a path for AA fellowship members to support the newcomer upon their release from a treatment facility. The chances for these folks achieving long term sobriety increases the sooner they get into a steady diet of meetings. The path to success begins on day one! To learn more about the program contact: William B., District 8 Treatment Chair. Learn how AA Operates, where new literature comes from, how we reach AA's in other countries and how you are already participating in that process. NO COST: Your 7th Tradition contributions funded this event. PRESENTED BY: District 4 of Area 32 & the Last Chance Group, Saline. Speakers, Games, Fun, and Laughs. Free park entrance when you mention "Bill W. Picnic" at the gate. Grilled chicken, hot dogs and condiments will be provided. Bring a dish to pass if you can. Remember to bring a lawn chair! Get the latest news and fliers for MCYPAA events around the state at the MCYPAA.org web site's "Events & Meetings" page. Here's the MCYPAA 38 program. To have your events posted send them to the Area 32 web servant. See Web Site Guidelines for appropriate content.